The #808080 colored line here is actually transparent, and anything from the window below will show here. Just so happened that the background was #808080-colored here. As you can see here, in a non maximized state the taskbar area is (correctly) three pixels higher which then covers the transparent area. Which tree should I be barking up first to try to fix this? Windows 10 "v 1803", says WINVER. I didn't ask about the Windowblind correctly. What I'm looking for is the name of the WB you are using. Is this a problem with any WindowBlind you apply? You just need to change the Maximized Caption graphics size from 154x40 to 154x46 pixel since the normal top caption is size at 162x46. In the screen shot I've change that part to 154x46 and can confirm that the 3 pixel transparent part is gone. You are a genius! It works. These "borders" in the same menu, are they the window sizing borders, and if i made them wider/higher, would it just work and automatically make the sizing control wider/higher? I would just test it but I'm a little bit afraid to go down this rabbit hole not really knowing how it all works ..
Not sure on which part you are referring to. A screen capture might help me understand. 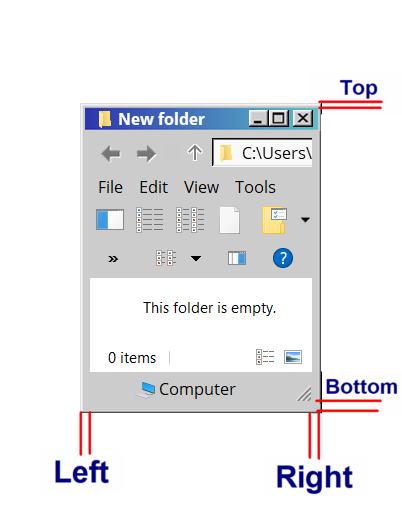 In W7 (or was it earlier) I seem to remember a setting to make these "grabbable resizing edges (for lack of the correct term)", fatter with a setting that you just accessed from the desktop properties. OK, I just experimented and might have figured it out. 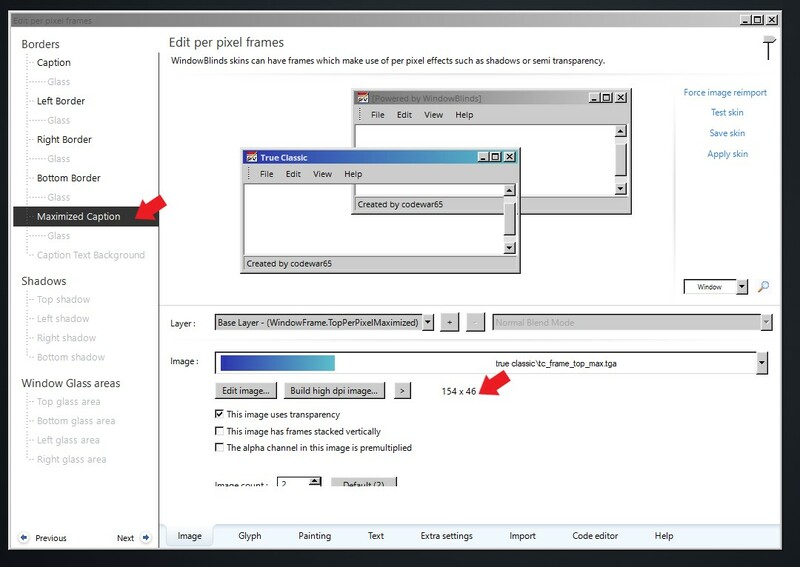 It seems that Windowblinds is smart enough to extend the sizing area if you just extend the images for the left, right and bottom border. But changing the top frame sizing area seemed to cause very many other bad ripple effects throughout the whole skin, and without knowing this stuff it's probably in too many places to fix easily. Is there some easy setting that compensates for changes in the sizing area size? Or do you have to adjust every text/ button/ etc individually? I guess I have to keep experimenting. Apparently the route these guys take is to somehow disable the DWM (Desktop Window Manager) and it seems potentially extremely messy, I imagine that tweaking the Windowblinds "True Classic" skin is actually a much better way to go. you are in the correct area. Actually you want to change the "OS Caption Height"
Try somewhere between 26 and 30.